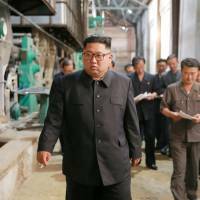 SEOUL - North Korean leader Kim Jong Un’s strident rebukes of officials during recent trips to industrial sites were aimed at rallying support at home for his economic drive and convincing outsiders about his willingness to denuclearize. After racing toward his goal of developing a nuclear-tipped missile capable of hitting the United States, Kim in April shifted his focus to the economy. In June, he held an unprecedented summit with U.S. President Donald Trump in Singapore, where he lauded the city-state’s economic progress and “world-class” amenities. This month, the young leader has toured industrial facilities and special economic zones near North Korea’s border with China, often lambasting officials over delayed construction projects or lackluster modernization of production lines, according to state media. Kim has openly slammed executives on previous economic field trips, unlike his reclusive father. The latest criticisms appear to attempt to spur economic development nationwide — and shift blame to bureaucrats where progress has lagged, experts say. “Now that economic development is made a main party line, he needs to show results but could have realized things were not so beautiful on the ground,” said Koh Yu-hwan, a professor at Dongguk University in Seoul. With nuclear talks with Washington underway, Kim may also want to dispel suspicion about denuclearization by highlighting his zeal for economic development. Kim made a broad commitment at the Singapore summit to “work toward denuclearization,” but fell short of details on how or when he would dismantle the nuclear programs. “While trying to win the people’s heart, Kim would want to show that he’s making an all-out effort on the economy and he really means it, and defuse suspicions about denuclearization,” said Lee Woo-young, a professor at the University of North Korean Studies in Seoul. This week, Kim blasted “shameless” and “pathetic” executives at a power plant site in northeastern Hamkyong province, “speechless” after realizing that only 70 percent of construction work has been completed since it was started 17 years ago, the official KCNA news agency reported. 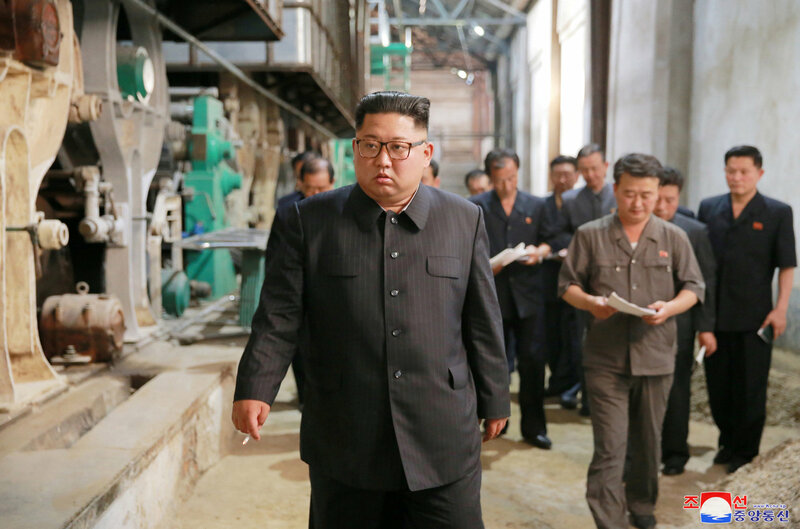 Earlier this month, Kim berated managers of a textile mill in the border city of Sinuiju for blaming the lack of raw materials and money despite their poor work at the planned upgrade of the factory, according to KCNA. The rebukes appeared part of Kim’s efforts to mimic his popular, affable late grandfather, Kim Il Sung, in creating a bond between the leader and the people, said Michael Madden, a North Korea leadership expert at Johns Hopkins University’s 38 North website. “That some senior officials are being lackadaisical in their officials duties, he made a point of saying they only come out for the official opening events and aren’t being responsible in the daily work,” Madden said. Kim’s recent tour of the northeast was the first full-fledged provincial visit in more than a year and illustrated his changing priorities, said Hong Min, a fellow at the state-run Korea Institute for National Unification in Seoul. Kim has made 11 appearances at economic events and three military inspections so far this year, mostly near Pyongyang, according to a Reuters analysis of data by South Korea’s Unification Ministry. Between January and July last year, Kim took 30 military trips and made 15 economic outings. Large scale trips to regional areas are usually planned three months in advance after careful deliberations on the location, and the pick of the border region suggests Kim’s resolve to boost economic cooperation with China, Hong said. “Where he goes first matters, especially after a pause, because it gives different messages depending on the region,” Hong said. Kim has traveled to China three times since May, and also sent a high-level delegation on a 10-day tour of major economic hubs in China. Shin Beom-chul, a senior fellow at the Asan Institute for Policy Studies in Seoul, said Kim’s goal may be to encourage Beijing to push back against U.N. sanctions that have squeezed North Korea’s economy.